Donations come in through your PayPal interface and can be one-time or recurring. Accounts are set up for budgeting so your donations received can be tracked against a revenue account for the Annual Budgets by country. 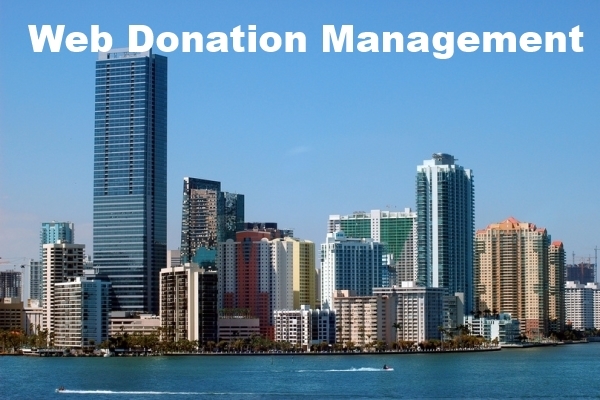 Donations can have destinations and all donors immediately get a free on line account to print off their donation reports. Future donations can be used with this account. For non web users there is not only a donation thank you report that can printed out for 1 donation, but at year end the total donations reports and mailed out for tax deduction purposes with the charities ID and address. This user donation account also is an eCommerce Shopping cart for them to purchase any matieral you desire. Web donations are automatically added to all the donations and budget accounts. Paper mail in donations such as checks or even cash donations are entered manually into the system and you have the option to attach a donation destination for that donation for budgetting purposes. No need for you to write reports since we pull data directly from your tables through SQL. We have already written the reports for you which show up in the AdminReports screen. More than 15 internal reports are there for you to manage sales transactions, total sales, email logs, E-Merchant transactions, inventory, clients, etc. Many of these reports are drill down reports meaning they have hyperlinks on them for you to click on a row to get more details of that row. Since BizSAS Reports are standard html, they are supported on Internet browsers world wide. Browsers on desk tops and laptops and even Pocket PCs. Since you choose the number of columns you want in a report, you could look at the key columns on your Pocket PCs and look at all columns on your laptop or desktop. A client must have a username and password before they can log on. Password expirations are set by the Main Administrator so clients are forced to change their password every X number of months (X can be 1 through 12 months). Usernames (Login IDs) are unique so no 2 people can have the same username. BizSAS has tons of security built into it from the software application to the hosting application. The hosting system has intrusion prevention and spam control. The web site is secured with 128 bit SSL encryption key. The BizSAS application itself has password encryption so that even the database administrator can not steal anyones password. BizSAS also has session control that checks if the client is still on the same session they started with. This stops URL hackers from trying to steal a URL and jump into the application. In Summary, BizSAS has all the top security web controls to make your data and application safe. 1) alert screen when you first log on to show you action items. Screens to enter international text for your help and screen text. If you set up a separate contract with Your service Provider for language support other than English, your customers can choose the preferred language at login such as English, Spanish, French or other languages you set up. 2) Set up packaging calculations, shipping costs by different couriers, volume discounts, sales tax rates by state/province or country. Set up testing in a sandbox environment to track test credit card transactions versus live ones. 4) Sum up sales tax from all orders and track periodic payment submission to government agencies. 6) Post to external accounting systems along with sending an email to your designated accountant. Track postings to match up systems. There is a separate sales tax post that matches the timing of your sales tax submissions.